Body measurement and weight influence numerous aspects of an individual’s overall health. It is consequential at every age. Medical conditions like obesity and diabetes can strike children and adults alike. A family history of such ailments further stresses the need to keep one’s weight in check. The best way of doing so is by maintaining a record. Those who wish to make an improvement must track their progress. This is a process of self-monitoring. It enables one to analyze one’s habits and actions which impact the actual goals. This is extremely important for proper weight management. Those who love to accept challenges can enjoy this process as an exciting game. Different people establish a weight loss regime for various reasons. It may be done to acquire physical beauty or for the sake of health. One’s body measurements and weight are based on a number of factors. These include age, gender, height, eating habits and the level of physical activity. The rate of metabolism carried out by the body also affects how fast an individual gains or loses weight. Keeping all these factors in mind, nutritionists and physical trainers create a suitable plan for different individuals. A weight tracker plays an important role in ensuring the effectiveness of such plans. On the other hand, it also helps in keeping one motivated. Discipline is maintained while following such weight loss strategies. A weight tracker can be in the form of a food diary or weight loss journal. Alternatively, a more sophisticated way of maintaining this record is through computerized trackers. The results are accurate while the calculation process is quick. These results can be saved for future reference. This makes a dieter’s progress tangible. The reason why most individuals quit is that they fail to see immediate results. However, once the tracker shows you your progress, it is easier to achieve gratification. This, in turn, makes one feel more encouraged. Such motivation plays a crucial role in carrying on with the weight loss regime. 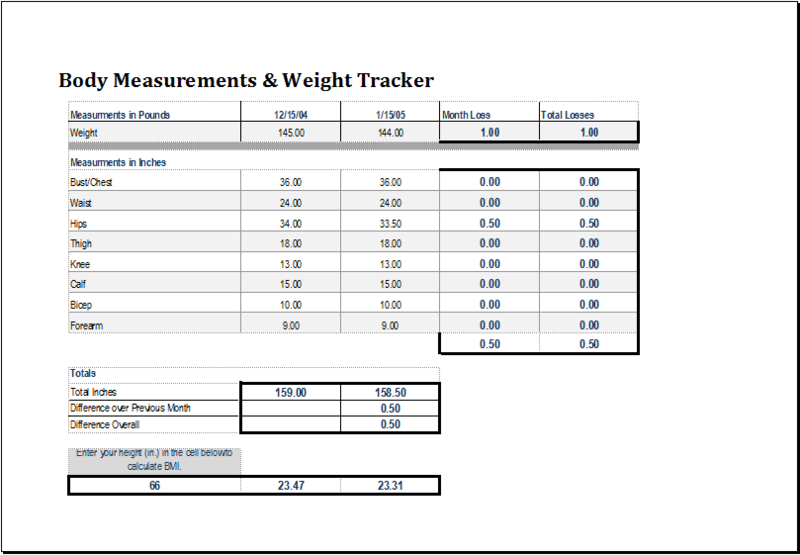 Several websites offer body measurement and weight trackers. Simply type in the correct parameters and get your results instantly. A sample is also given here and we hope this helps.